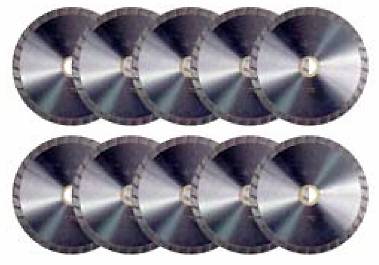 DX - Turbo - 10 Pack 4.5" up to 7"
DX - Turbo - Multi-Packs. General use, economical turbo blades for cutting granite, tile or other hard natural stone. Bulk packaged in lots of 10. 5" /125 7/8 - 5/8"
Fury -Turbo 4" up to 8" Granite Blades Rambo 12" up to 18" 360 PT 12" up to 20" Granite Rodding Blades.